Update 30/3/15: Since writing this blog entry I've posted a number of others. The last, 'Barking up the wrong tree? A reinterpretation of the Blipfoto/Polaroid tie-up' should be read alongside this one. Thanks. This blog entry, the fourth in a series on the uncertainty surrounding the future of Polaroid Blipfoto, analyses the web traffic increase at my site - fergusmurraysculpture.com - over the period 17 to 21 March 2015. This increase was entirely caused by the blogs I posted and the social media and blog links to these. I have looked at the traffic generated to see if it is possible to develop a better understanding of the Blipfoto community with all the dangers inherent in using a small and uncertain dataset. At the end of the blog I've suggested three things that can be drawn from the data and the possible knowledge it gives us of the Blipfoto community. If you were one of the many blog readers who didn't last ten seconds on the other pages I wrote I suggest you scroll to the bottom *really quickly* for the take away points. Website traffic at fergusmurraysculpture.com during March 2015 and the Blipfoto blogs effect (JimDo statistics). The chart above shows the dramatic increase in web traffic at my site - which I can assure you is not monetized in any fashion - following the publication of three blogs about Blipfoto on March 17th, 18th, and 19th in 2015. Using Google Analytics I wondered if the data behind the aggregate web traffic could tell us anything about Blipfoto. Throught out the analysis presented here it is vital to bear in mind two really important caveats. Firstly, this is but a Blipshot of self-selecting internet users - who may or may not be Blipfoto users and who may or may not be representative of the broader Blipfoto community (which has been said to number 'tens of thousands'). And secondly, the underlying traffic on my site, which chugs along at about 50 visitors a day, has to be discounted. With regard to the three Blip Blog pages and my generic blog page these received 1,948 views between 17 and 21 March out of a total of page impressions (which I assume is the same as 'views') of 2,500, that is 78% of all page views. Page views at fergusmurraysculpture.com 17-21 March (JimDo statistics). During this period there were 1,715 visitors to the website with a high percentage of returning visitors - 32% - suggesting people came back to look at the different pages as they went up. 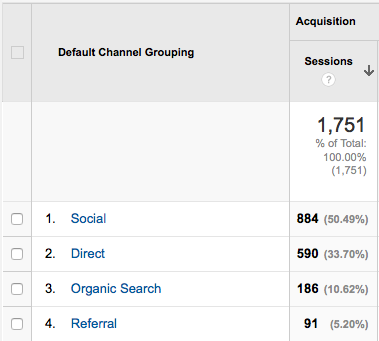 Website sessions for that period came through four channels - social media, direct, organic search and referral. 50% (884 sessions) per cent came from social media with the great majority from Facebook and the remaining 41 from Twitter. 34% per cent were direct - (which Google Analytics support defines as 'a user used a bookmark or typed your site URL into his or her browser'). And 11% came from internet searches and 5% from referrals - with 54% of the latter coming from Ian Stevenson's blog at Salient Point. Channel origin of web traffic sessions to fergusmurraysculpture.com 17-21 March (Google Analytics). What does this last data tell us? In a nutshell, that having the Facebook Blipfoto Friends page has been critical in getting traffic to the blog pages and that cross-referral between blogs is also important. The Facebook page is particularly important because this is a closed (ie non-public) page and I would imagine that nearly all its members are members of the Blipfoto community. By enabling the Advertising Features, you enable Google Analytics to collect data about your traffic via Google advertising cookies and anonymous identifiers, in addition to data collected through a standard Google Analytics implementation. Regardless of how you send data to Google Analytics (for example, via the Google Analytics tracking code, Google Analytics SDK or the Measurement Protocol), if you use Google Analytics Advertising Features, you must adhere to this policy. So no demographic data unfortunately. But in terms of the geographical data that is available - see map and chart below - shows that the UK and the US accounted for the vast majority of sessions (62 and 12 per cent respectively). Europe, Australasia, South Africa and Brazil, India, Vietnam and the United Arab Emirates comprise the other locations. Cyprus, South Africa and New Zealand are probably over-represented in that I get traffic from these countries to other page groupings on the site - particularly my site's all time most visited page The history of Cape Town's townships in the 67,000 page views the site has had since Dec 2011. Geograpical origin of fergusmurraysculpture.com site sessions 17-21 March 2015 (Google Analytics). 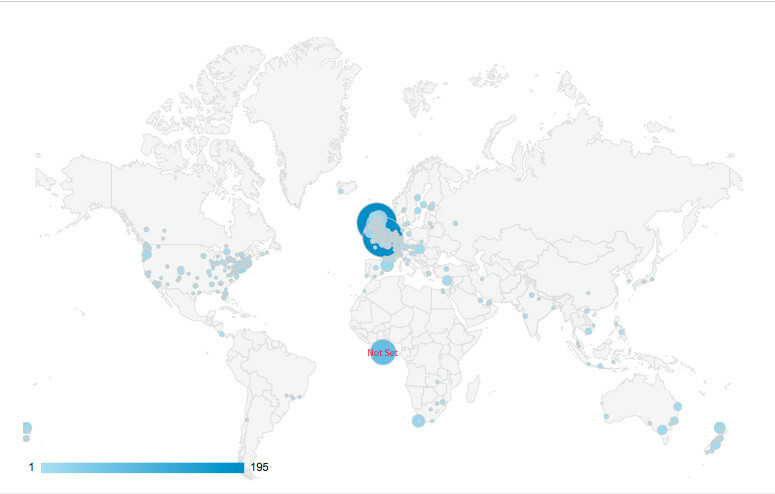 How do you interpret this geographical data bearing in mind the caveats at the start of the blog? I think broadly it's possible to say that those members of the Blipfoto community engaging with the Facebook Page Blipfoto Friends and the blog on my site are overwhelmingly from the UK first - by a long shot (63%) - and the USA (12%) second. But that these two countries 'only' account for 75% of the traffic and that there is a broad spread of session visits from a wide range of countries. Whether or not this is representative of the broader geographical location of Blipfoto users is another point but I would imagine (for no other reason than it seems to fit in with the company's historical development) that it is. Top 25 countries by origins of sessions at fergusmurraysculpture.com site sessions 17-21 March 2015 (Google Analytics). If we look at the data by the top 25 city-origins of website sessions this shows - that at least from the data set here of self-selecting Blipfoto users and interested parties - Blipfoto still has strong Scottish roots with 16% of sessions originating in Scottish cities with Edinburgh in the lead of city-origins overall at 10.8%. City-origins of website traffic to fergusmurraysculpture.com 17-21 March 2015 (Google Analytics). Top 25 City-origins of website traffic to fergusmurraysculpture.com 17-21 March 2015 (Google Analytics). Whilst remembering that this data is not statistically representative of the Blipfoto user community for the reasons described above it is interesting that there are only three US city origins in the top 50 city-origins for the data set - New York, Portland (Oregon), Warwick, (Rhode Island - thanks David!) and Seattle. And that the English city-origins do not suggest a concentration in the North of England I had imagined. 26-50 top city-origins of website traffic to fergusmurraysculpture.com 17-21 March 2015 (Google Analytics). What can we suggest about this geographical data? If, as suggested in previous blog entries, Blipfoto has been pushing to develop it's US user base, from this data it would suggest it has some way to go. Further, if the Polaroid Blipfoto phase pressages post-liquidation - as seems very likely- an acquisition by the US owners of Polaroid and stronger links between Blipfoto and the Polaroid brand - which is (I think) strong in the US but weaker in Europe - this could prove challenging. But again, the data here is a particular snapshot of a particularly engaged user. I would suspect that this data tends to be more representative of the longer-standing Blipfoto users. It may be that there is stronger demographic representation in the US won in the last year or two (or last three months even - although Blipfoto Chair, Ian Ritchie's comments (see first blog rather go against this go against this) that is less engaged and less aware of the troubles swirling around the company. Session duration of website traffic to fergusmurraysculpture.com 17-21 March 2015 (Google Analytics). Lastly, and for the sake of openness, although I've suggested that the number of visits to the Blipfoto blogs at my site is suggestive of a strong sense of user community 'engagement' it's important to point out that of the 1,806 sessions between 17 and 21 March 1,500 were 'fleeting', to say the least, at 0-10 seconds duration. Perhaps more heartening is that 14% of the sessions were timed at between one and thirty minutes. If ever there were ever a message that long-windedness (or even middling-windedness) is a turnoff on the internet this is surely it. And I guess if you were one of the 10 second sessions visitors you'll not be reading this either. Is there anything to be learnt from these, after all fairly scant, statistics? Firstly, if a user community wants to engage with its 'owner', company or whatever, it is much stronger if it can know itself beyond the personal links and knowledge that its members have. Secondly, if a user community is to represent itself it's handy if it not only knows itself and has access to 'independent' data but also has a way of talking to itself though an independent forum. And it does occur to me that if the Blipfoto user community had a database of its members - even partial - and a way of communicating with them this could be a powerful tool in representing itself and even, should it come to it, organising an orderly migration elsewhere while putting it possibly in a position to win certain concessions. Thirdly, the data here, with all the reservations noted, suggests Blipfoto - at least in terms of of it engaged users - is very much concentrated in the Scotland and England and the UK (62%) with the USA coming second (12%) and then a broad but relatively thin representation in other European countries, Australasia and South Africa and an even thinner representation in many more countries. It will be interesting to see what the new owners have to say when they communicate with the Blipfoto community in terms of their strategic direction and possible investment in the website, marketing campaigns, revenue generation and possible links with other Polaroid licensees such at Polaroid Fotobar. As usual I welcome comments but if you disagree with what I have to say I'd really appreciate it if you could say why you disagree and what alternative analysis you want to offer. "...the broader Blipfoto community (which has been said to number 'tens of thousands')..."
I never understood why Blipfoto kept the number of users confidential. Surely increasing numbers would be proof of 'success'? Just to add my unscientific twopenceworth. Portland, OR and Seattle, WA are perceived by me as being populated by well educated open and progressive thinking people; no wonder they would engage with Blipfoto. I'm sure many blippers like me in the US are ex-pats. The charm of Blipfoto for me is maintaining a personal connection with the British Isles through the journals of everyday folk (sounds a bit like the Archers used to be doesn't it?). So I would expect that charm of Blipfoto would not be so attractive to the world at large. This is intriguing. I know there is no surprise but it is interesting to see three Scottish cities in the top five. When I started on Blip four and a half years ago there seemed to be a particularly large number of Blippers from Finland. I don't know if that is still the case.